Facebook Bug Declares Millions of Users Dead, Including Zuckerberg! Last night, Facebook declared everyone dead, including the company's CEO Mark Zuckerberg, in a massive memorial 'remembering' profile glitch. Despite being very much alive, Facebook users, when logged on to their accounts on Friday afternoon, found their accounts turned to a "memorialized account," strongly suggesting that they are dead to everyone who visits their profile. "We hope people who love Mark will find comfort in the things others share to remember and celebrate his life." When the message appeared, thousands of users shaken by the incident complained on Twitter about their premature digital deaths, offering their proof-of-life so that their concerned relatives could calm themselves down. This weird glitch was first spotted by Business Insider when several of its employees saw the message at the top of their Facebook profiles on Friday. "For a brief period today, a message meant for memorialized profiles was mistakenly posted to other accounts. This was a terrible error that we have now fixed. We are very sorry that this happened and we worked as quickly as possible to fix it." It now appears everyone on Facebook is back to life and things have calmed down. Facebook introduced the memorial feature in 2015 after a number of high-profile cases where families wanted to access their loved ones' social accounts. 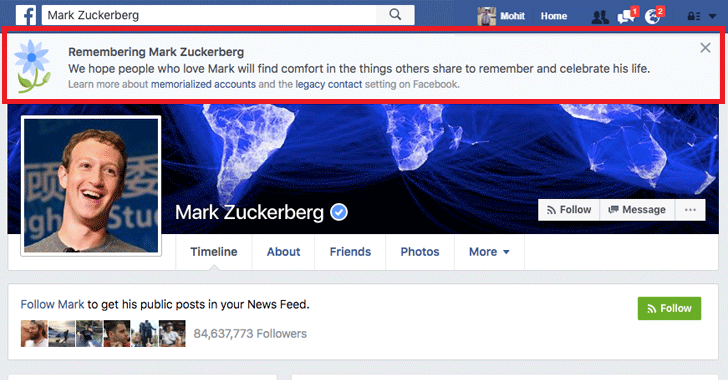 The users can opt to have their account completely delete after their death or turn into a memorial page so that their Facebook friends and families can leave messages and share memories on their profile. So, Are you alive right now? Let us know in the comments below.